At Winter NAMM 2012 in Anaheim, California, booth #6976, Audix introduces another set of drum and percussion microphones by launching the FP QUAD, a cost effective alternative to the DP QUAD drum microphone pack introduced in 2011. The FP QUAD pack is designed for use in club, rehearsal, school, House of Worship, and home recording environments. The Audix FP QUAD drum microphone pack represents an effective combination of microphones needed to capture the depth and imaging of a full drum kit, featuring the F6 dynamic microphone for kick drum, the F5 dynamic microphone for snare drum and two F9 condensers microphones for overhead applications. The F5 and F6 are high SPL, dynamic microphones suitable for close miking and for capturing the attack and percussive sound of the drums. The F5 reinforces the depth and snap of the snare while the F6 mic delivers punching lows through each strike of the kick drum. The F9 pre-polarized, condenser microphone with its 14mm gold sputtered diaphragm, is suitable for overhead applications. Depending upon the position, the F9 mic will pick up the high hats, tom fills, cymbals and ambiance of the entire drum kit. As with the DP Quad, Audix has created a demonstration video for the FP QUAD. The FP QUAD drum pack includes a stand adapter for each mic as well as a DFLEX rim mount clip for use with the f5 on the snare drum. Packaged in a heavy duty, aluminum carrying case, the FP QUAD pack is available through authorized Audix dealers. 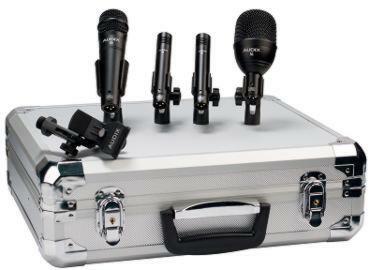 Also at Winter NAMM 2012, Audix introduces two professional band packs, the BP5 PRO and BP7 PRO which contain five and seven piece, studio quality Audix microphones. Plus, new for 2012, two affordable, equivalent band packs, the BP5F and BP7F. These combinations include five and seven microphones from the dynamic Fusion Series. Audix co-founder and VP of Sales, Cliff Castle explains, "The Band Pack idea evolved after years of working together with artists and engineers on all performance levels. Because the Audix instrument microphone packs were a tremendous success, the next logical step was to offer complete ensembles which include both vocal and instrument microphones that complement each other and work in tandem. Staying true to our mic pack philosophy, we are able to provide pre-packaged microphone sets at a huge savings compared with purchasing the mics individually." The BP5 PRO is a five piece professional microphone pack which includes the D6 and i5 instrument mics, the industry standards for miking kick and snare drums. The D6 and i5 have proven to be the cores of any drum kit and the foundation for every groove. Add the world class OM5 lead vocal dynamic microphone and two OM2 dynamic vocal mics for support and you have five essential mics for any band or stage performance. The BP7 PRO is the same robust package with two additional microphones - the i5 dynamics, for miking guitar and bass cabinets a well as a wide variety of instruments. © 1997 © 2012 Pro-Music-News™. All rights reserved. Thank you for visiting Pro-Music-News.